In an article posted October 6, 2017 by the Toronto Star, Mayor Tory announced Councillor Joe Mihevc as Toronto's new poverty advocate, and myself as one of four Deputy Mayors, each representing a designated part of the city. I am both honoured and humbled by the appointment, and will continue to represent Ward 18 in addition to my new responsibilities. Councillor Bailao will represent Toronto and East York while Councillor Mihevc will push for poverty reduction after both roles were left vacant following the death of Pam McConnell. Councillor Ana Bailao has been appointed one of the city’s four deputy mayors, an acknowledgment of her place within the mayor’s inner circle. 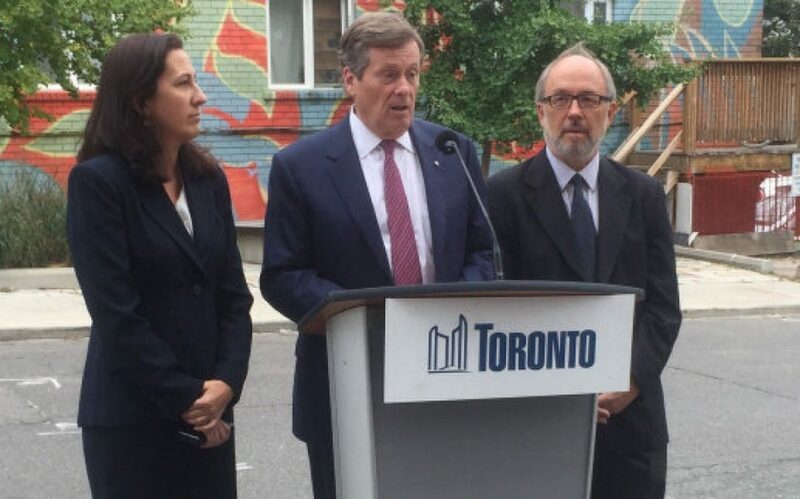 Tory made the selection official at a press conference Friday morning, where he also named Councillor Joe Mihevc as the city’s poverty reduction advocate. Both were positions left vacant after the death of councillor Pam McConnell in July. Bailao, who will represent Toronto and East York as deputy mayor, will fill one of three positions which are largely symbolic. Tory called her a “tireless” affordable housing advocate, a position she was given earlier this term. “It’s about creating this sense of opportunity in Toronto because only when everyone has opportunity in our city will we succeed as a city,” said Bailao on Friday, reflecting on immigrating to Toronto at the age of 15. Council typically has one deputy mayor that serves as the mayor’s alternate in his absence. But after Tory became mayor he championed the idea of a unified “One Toronto,” he made a point of picking a deputy mayor for each of the former cities. Tory recalled Mihevc — who is well connected to progressives, academics and community groups in the city pushing for poverty reduction — urging him to invest more in the city’s student nutrition program after it was squeezed under the mayor’s austerity measures. “We can act, we have acted and we’re going to do more,” said Mihevc, who has voted with Tory on key items just 40 per cent of the time this term, according to a scorecard kept by Metro’s Matt Elliott. McConnell was a longtime social justice advocate who was working to fulfill a strategy laid out at council to reduce poverty through housing, student nutrition and other solutions. Both Bailao and Mihevc said they had big shoes to fill. “We believe that a better Toronto is possible. We believe in the Toronto the good, a Toronto the just, a Toronto for all,” Mihevc said.